We’re in the way-too-long check out line at Target and there’s a little kid there just screaming. Flailing. Kicking. He wants that candy bar, his mom said no, and he is going to make her pay. Strangers are staring at her, she’s flustered, and she keeps saying “do I need to take you to the car?”. We all know that’s an empty threat because she’s in line with a cart full of stuff she needs, and if she could just get him to cooperate for a minute they’d make it out alive. She grabs him the candy-bar, and suddenly the world is better. Her boy is back to his happy demeanor and is excited to dive into his chocolatey treat the second the cashier hands it back to them. This, my friends, is a tantrum. They happen to the best of us, and we spend the better part of our children’s toddler and preschool years trying to teach them not to do this. So what, then, is a sensory meltdown? A boy with his mom in target who asked for a candy bar and was told no. The screaming, flailing, and kicking occur, but even when the mom gives in, the boy doesn’t stop. He continues the fit well after the mom gave in to the original request, and often well after they even get to the car and drive home. This wasn’t even caused by the candy at all, that was simply a trigger that set it off. This is a sensory meltdown. 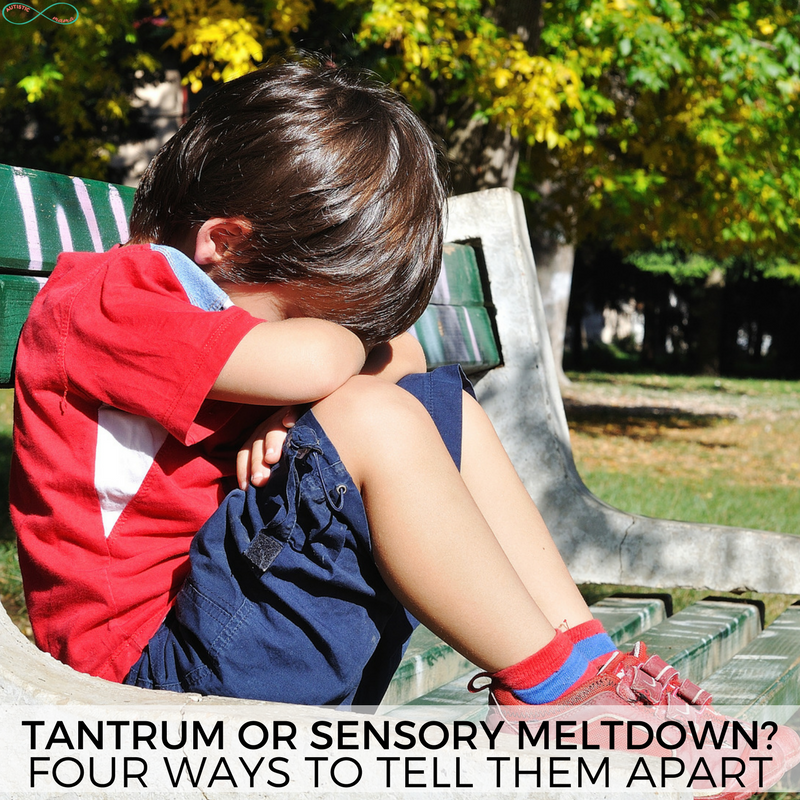 Now tantrums and sensory meltdowns require completely different reactions and solutions. Preventing them is an entirely different ballgame as well. So when you’re in the thick of it, how do you tell the difference? 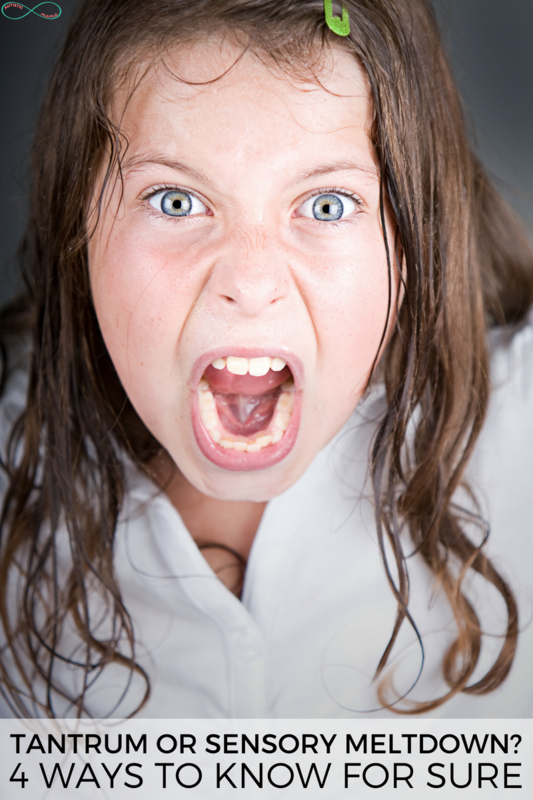 Toddlers and preschoolers throw temper tantrums because they’ve lost their temper. They wanted something and were told no, so they are going to throw a fit. Their friend took their toy, so they’re mad. Tantrums are always about something they don’t like, that they want fixed. A sensory meltdown is caused by neurology. A child with sensory processing disorder or autism doesn’t choose to get overwhelmed. Their brains are wired differently so that they interpret their senses differently than neurotypical people, so to them it is literally painful to endure certain situations. Their body’s fight or flight system kicks in, and when fight wins we end up with a sensory meltdown. We’ve all seen a child throwing a tantrum and taking every chance they get to watch their mom’s reaction. A tantrum can be fueled by the attention it receives, so many experts advise moms to ignore the child during the tantrum. As a mama of four, I can tell you, this works with tantrums! Ignore them. If you’re at home, go to another room. If you’re out and about, you will get mean looks from strangers, but ignore them too. A tantrum is only effective if it’s given enough attention to give the child their way, so don’t do it. A sensory meltdown, however, doesn’t care about attention. A child in the middle of a sensory meltdown will have no idea who is paying attention to them because they truly don’t have the energy to care. If a child is throwing a tantrum over a candy bar, and you give them that candy bar, the tantrum will stop. It might take a bit for the child to realize that you’re giving in and calm down from the fit they’ve worked themselves into, but they will stop and enjoy their candy bar. If a child is having a sensory meltdown triggered by being told no about a candy bar, giving in and letting them have the candy bar won’t help. Because the candy bar was more like the tip of the iceberg. Most sensory meltdowns are caused by a mountain of sensory overwhelm with one final trigger sending them over the edge. A child throwing a tantrum may “throw themselves” to the floor, but if you watch closely they will often catch themselves before they hit the floor and be a bit more gentle. A child in the middle of a sensory meltdown can often lose control. If they fall to the floor, they’re hitting it hard. If they hit themselves, it’s truly hurting them. Like I mentioned above, a child going through a sensory meltdown is really going through every sensory trigger they’ve experienced all day, so they are often not even aware of what they’re doing during the meltdown. Sensory meltdowns are a really frustrating part of sensory processing disorder, and as parents, we are always doing our best to support and help our children through them. But it can still be really frustrating when people out in public don’t fully understand our kiddos. Sometimes their stares just feel like too much. Sometimes the off-handed comments really get to us. “My kid would never act like that in a store” “This is what’s wrong with this generation” “That kid needs a good swat”. I know, it gets so frustrating and you sometimes just want to scream at them. Well, believe it or not, they’re not actually heartless people (at least most aren’t) but they simply don’t know anything about sensory meltdowns. 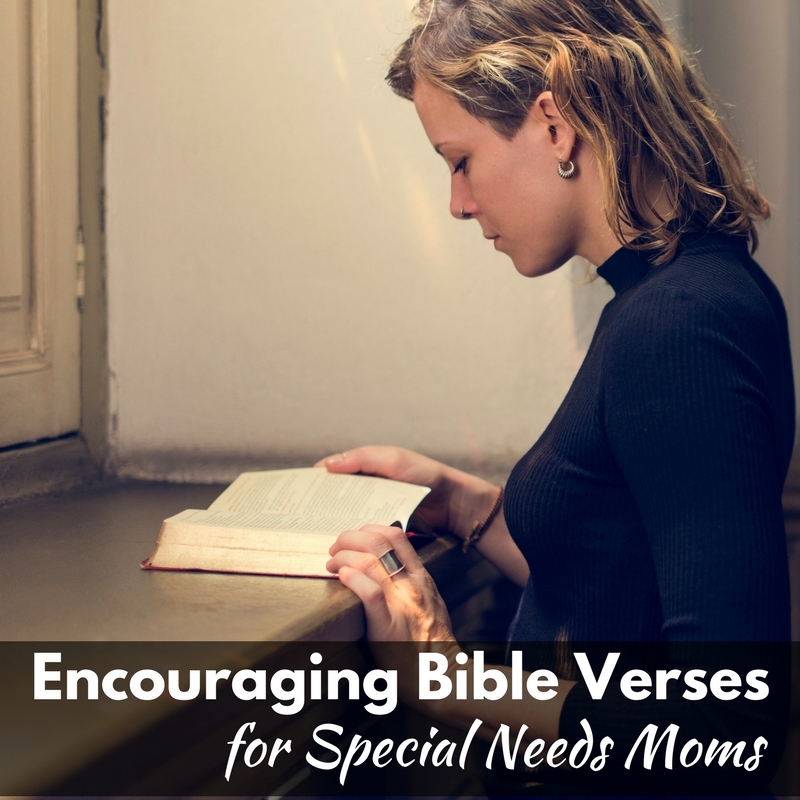 Of course, we want to help educate people and advocate for our kids at the same time, but in the moment it can be impossible to find the right words. That’s where these sensory meltdown awareness cards come in! These are business card sized cards that help to spread awareness and understanding of sensory meltdowns. You can print some off and keep them in your wallet or purse to give out when your child is struggling through a meltdown. Hopefully, they’ll walk away with a better understanding that allows them to be more compassionate the next time they witness a meltdown. 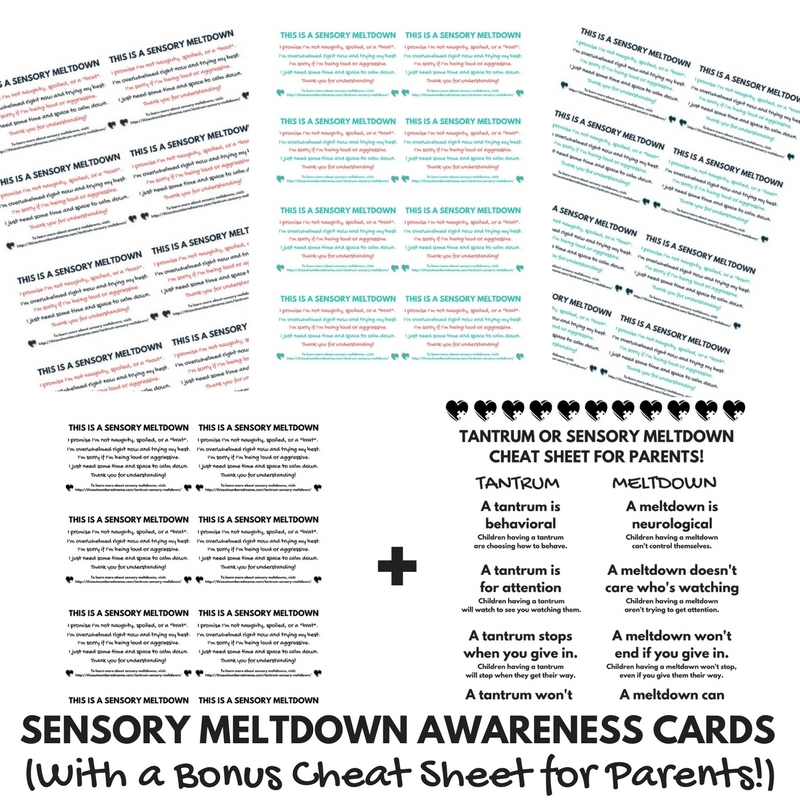 Oh, and with the sensory meltdown awareness cards, you’ll also get a Tantrum or Sensory Meltdown Cheat Sheet for Parents as a bonus! 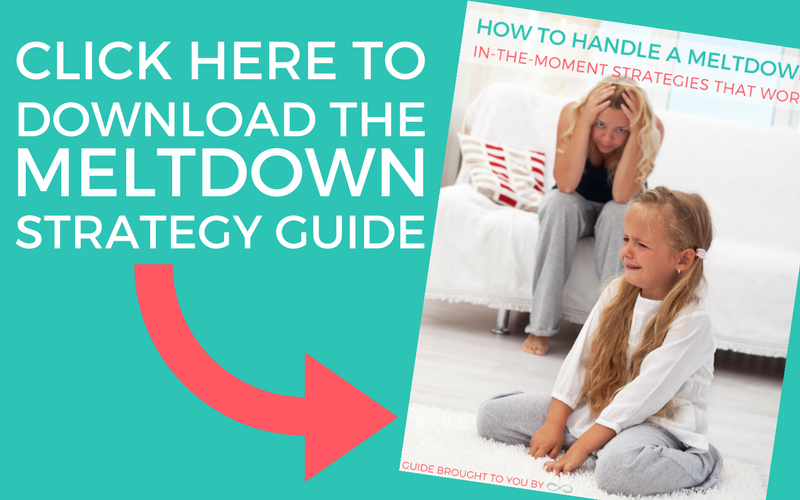 This sheet will help remind you each day how to tell the differences between a tantrum and a sensory meltdown. 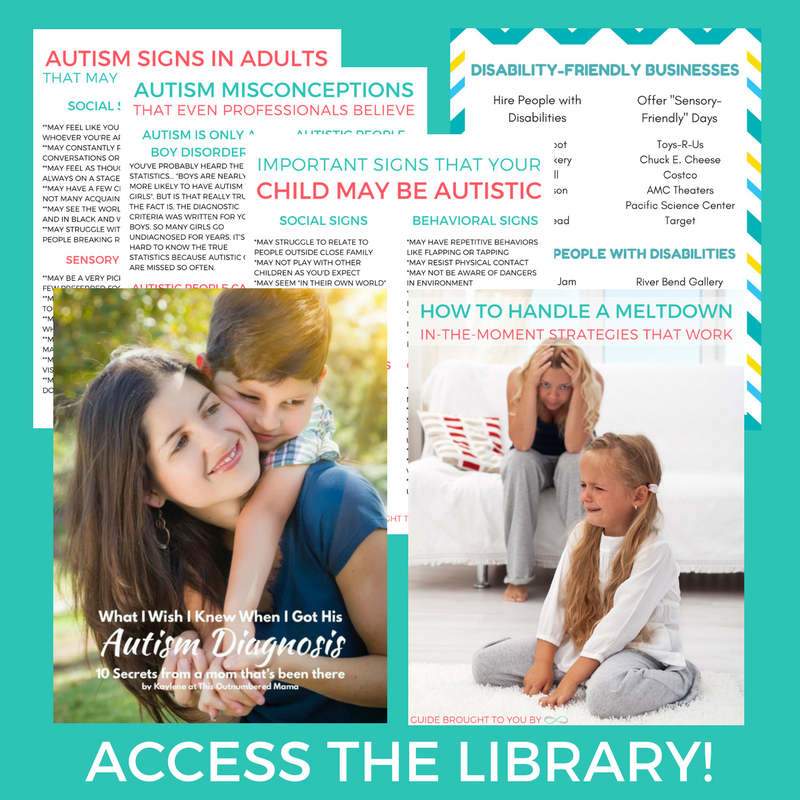 You can get the Sensory Meltdown Awareness Cards and the bonus Tantrum or Sensory Meltdown Cheat Sheet Here! It all boils down to intent. Tantrums are manipulative, calculated acts whereas meltdowns are not planned or intentional. The camel’s back does not break under one straw. I’m really not so sure that tantrums are always manipulative. Even the child who throws a tantrum until their parent leaves, and then suddenly stops, might not be manipulating the parent. It depends on the age, and the kid, but it’s also possible the child suddenly stopped because before they were in a safe space to express how upset they are, and now they’re not, because their parent is gone, or is suddenly ignoring them. That’s a scary thing for a lot of kids. Essentially, the child no longer throwing tantrums doesn’t necessarily mean the child is better. This is a nice clear breakdown of the differences between the two. Thanks for writing this! I think it’s important for parents and non-parents to know that there is a big difference! People can be so judgy and they may not understand why a parent is handling the situation a certain way if they aren’t informed about sensory meltdowns vs. tantrums. I’m going to share this on my blog’s FB page. Thanks again! Oh friend, I so agree! So many people judge the scenario before they know the situation. It can be so hard. 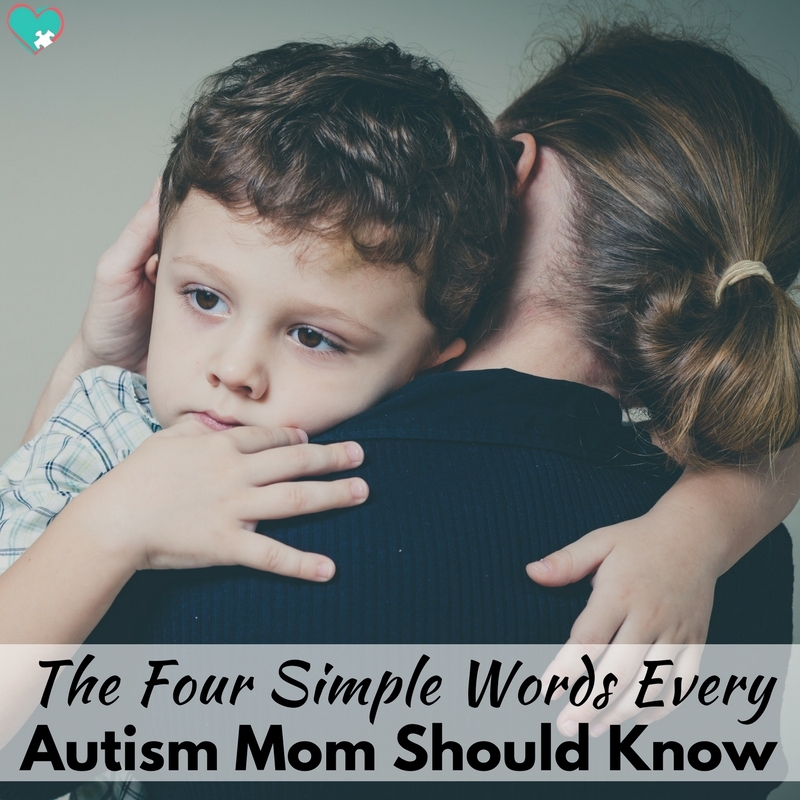 I know that I didn’t know the difference until my boys started therapy. So glad you found it helpful and I’m so glad to connect! A sensory meltdown is definitely not for attention! I can even tell by the expression on my son’s face when he is overwhelmed and things are getting to be too much for him. I completely agree, Karen! You can definitely tell the difference on their face between overwhelm and a tantrum! I think that any child can have a sensory meltdown, it just happens more often with kiddos who have spd/autism/etc. I have seen something start as a tantrum and turn into a sensory meltdown, definitely! Usually this happens when a child works themselves up so much that they get overwhelmed and can’t calm down. Hope that helps! This is a great post, Kaylene! I shared it on my FB page and a lot of my readers shared it- so many moms need help determining if it’s a sensory meltdown. Thanks for the breakdown! Thank you so much for sharing, Jaime! It can be so hard to know whether something is behavior or sensory. Glad so many have found this post helpful! I have to disagree about the tantrum being bad behaviour. I believe tantrums arise due to the inability of our children to process their feelings – or that’s how I choose to see it. In the example at Target, the kid won’t start kicking and screaming in order embarass his mum enough that she’ll buy the chocolate (in my opinion). He will start screaming because he’s angry and dissappointed and does not have the tools to deal with those feelings. He’s overwhelmed. He’s unable to make them go away, primarily because he doesn’t understand what’s happening to him or why he suddenly feels like this. I don’t believe children “throwing tantrums” are being bad, they are losing control. So when my daughter has one of her moments, I go down to her level and explain to her as calmly as possible what is it that she’s feeling and why can’t she have that chocolate bar. Then I tell her that I’m there if she needs me, and I might try to hold her hand. And we wait it out. And I keep explainin those feelings to her, while she screams and punches and throws herself on the floor. And if people around us are bothered by the situation, they are very welcome to go elsewhere. And if they have a problem with my parenting style, they’ll better keep it to themselves. Anyway, that’s of course just my opinion and my doing! But I thought I would share! Yes this so much. I was very displeased to read the inaccurate information on tantrums. They may be about attention in old children say over 5 but certainly not in toddlers. Research shows that is truly about not being able to communicate effectively and process large emotions. I completely agree with you!!! Also frequent tantrums can be a sign that your child needs absolute control due to underlying anxiety…which is very common in ASD children. Also completely agree with you. I don’t treat “tantrums” as bad behaviour and (try to) approach them in a similar way to you. I don’t think my children are out to manipulate me (not often, anyway :-) ), they just sometimes lose it when things get a bit too much for them and I want to help them through those moments, not label them as naughty. I agree. 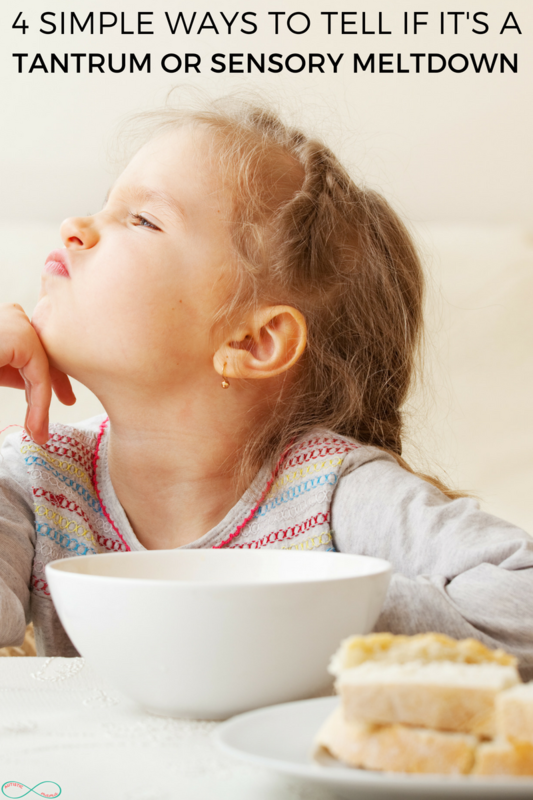 You don’t need to “give in” to the kid’s tantrums (give them the candy bar), but you don’t need to ignore them either. The kid doesn’t know how to express what they’re feeling, and if they’re asking for attention to deal with that (through disruptive behavior) maybe they need that attention. Nat’s description, of offering the child another way to express their emotions (words) and showing the kid he or she won’t be abandoned for having those emotions (by sticking with them, and not ignoring them) sounds perfect to me. Of course parents have needs too, and if you’re about to get very upset, taking a break might be a better option! That doesn’t make you a bad parent. But something I’ve noticed in people (myself, and my mom included) is the tendency to blame the other person for your own reaction. If I need a break, it’s not the kid’s fault for “wanting attention.” I don’t need to justify it, by saying me leaving is what the kid really needs anyway. Me needing a break is me being human, and having needs. As long as the child is left somewhere safe (i.e. not alone in a grocery store), there is nothing wrong with that. Thank you so much for this info. I’m raising my granddaughter that is now 2, and I’m here to tell you these melt downs are horrible:( I recorded one to show her doctor. This one happened to last a good 45 minutes. No signals, no warnings, just plopped down in the middle of the floor and started wailing uncontrollably. Nothing I did could soothe her. And forget about touching her! Just made it 10 times worse. So I sat close by and cried with her( not that she would know) I didn’t want to upset her anymore, so the tears were inward. Any advice on how to help then when they get like this? Just for informations sake, she was born drug addicted, so we don’t know what’s coming next with her. Thank you again for this article!!! Sincerely,Gina……. My daughter has some major meltdowns. She’s getting better than she used to be though. And no, it’s not throwing a fit. There’s a difference. During a fit, she gets angry from no getting her way. She cries, usually more if an almost fake cry. During a meltdown, it’s real tears. Uncontrollable emotions. She doesn’t want to be touched. I have to get down to her level, talk quietly and calmly to her, hold out my arms and ask if I can hold her to make her feel better. Then I wait a minute. She hugs me. I hold her tight and we breathe together. It took a lil practice, but now she’s able to do it alot of times on her own to calm herself. I just say “breathe big”. A few long, deep, slow breaths and she’s all good. Bless you Gina, you have the patience of a saint. Sending love and strength. Hi I am an early interventist and would love to be able to share your articles is there any way to get a printable version? Our son is 5 and Deaf (not on the spectrum as far as we know right now) and has LOADS of sensory issues. I’ve been that mom on the floor in Kroger, holding onto my son for dear life in an effort to keep him from actually hurting himself while flailing around and smacking himself in the head. The stares from people are so unwelcome and unappreciated.. I’d rather people just ignore it. It isn’t a temper tantrum.. it’s everything around him is just too much to deal with. Love your post! Keep on keepin on, momma! As a behavioral psychologist (now retired) who worked in the NJ Developmental Cennters as well as their prison system, so happy that thuis is posted and shared so other parents can read, listen, and pay attention. And THEY should NOT throw a temper tantrum over it UNLESS having a similar processing disorder. Normally, we do things for one of four reasons: seeking attention; to escape or avoid a task, request, or demand; to get self-stimulation; or to express pain or discomfort. The hardest part is assessing the function of the child’s behavior (or an adult’s). Once you know it, then the plan is to tailor treatment to provide a replacement skill that serves them the same function of the bad behavior (we call it “maladative”). Then and only then will they realize that doing something not bad will get them the same result. They key is also to provide them some type of reward so they will do the better behavior again. At first, give it when they even approximate (do something similar to or even making an attempt towards it. Then change how the reward is given for better exact replication of what you’re looking for. Once they do the behavior a lot, you can intermittently provide them the reward. Make sure whatever physical reward is given, you pair it with a verbal cue (good job or similar), so later that may be all that is necessary. But without that pairing, you could end up going back to square one. Oh Kaylene… What to say about you! Really you are an Angel… Last one year I’ve been struggling with the outer world to make them understand my 9 year old son wiith autism. Recently started reading your blog. I wouldn’t say it was an accident… As it is a blessing. Your words just reflect my inner voice. Nowadays, I keep quoting your phrases… to feel light and boost my energy. Thank you so much. Keep writing. Love from India. Have you read Janet Lansbury’s blog? She offers a different more gentle and thoughtful perspective on toddler behaviour and tantrums. I think what your saying about tantrums is really misleading. 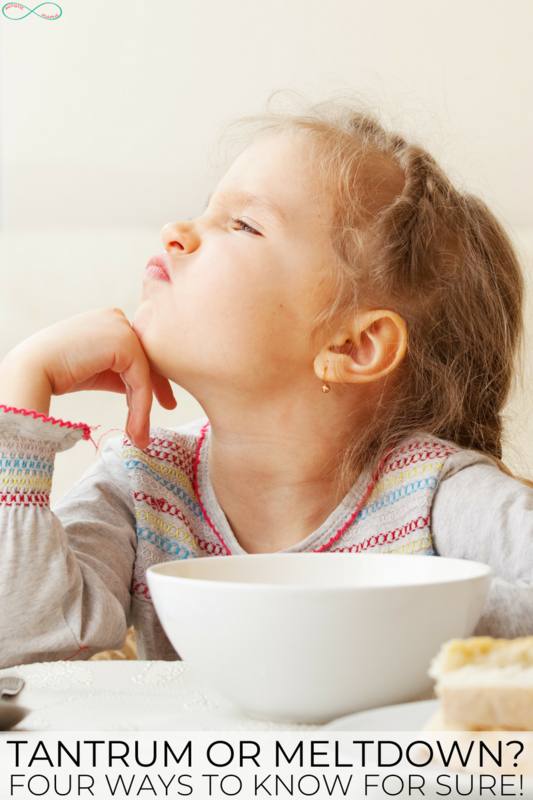 Toddlers don’t have the intellectual capacity to choose whether or not to have a ‘tantrum’. It is a meltdown of sorts (perhaps very different to the sensory meltdowns you mention), and they need to have a calm, centered adult who doesn’t give in, yet doesn’t ignore their very real feelings. The ‘tantrum’ is not about the chocolate bar to use your example. That was a convenient way to let of steam and unresolved lent up feelings about other things. Nurture your children’s emotions people!